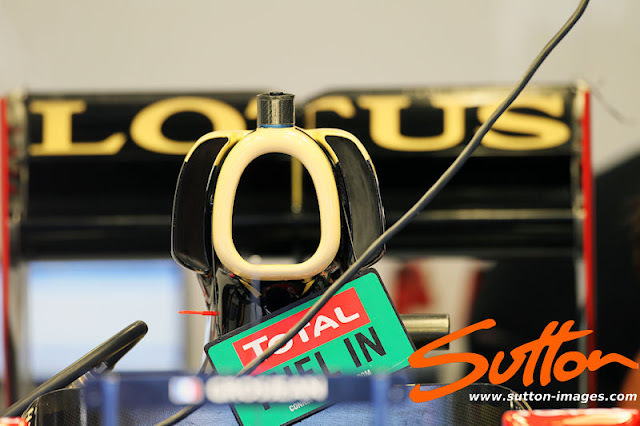 The beauty of Lotus' device of which I'm coining DRD (Drag Reduction Device) is it doesn't need DRS in order to work and reduces drag at a certain threshold. This means unlike the Mercedes DDRS system it will reduce drag even when DRS isn't available during the race. (1)In terms of additional parts the system appears uncomplicated with the addition of the Airbox 'Ear's, (2) internal ducting (3) the engine cover cooling exhaust, (4) the periscope that leads to the rear wing with the small ejector holes and the appropriately shaped beam wing Monkey Seat (5). During normal conditions air is presented to the 'Ears' and air moves down the internal tubing (2) toward the periscope. When 'Off Throttle' the main airbox receives more air than it can extract and so blocks off the entry point. This normally creates a backwash effect whereby the air stagnates in front of the airbox before counter rotating off the sides and over the engine cover at an undesirable speed. 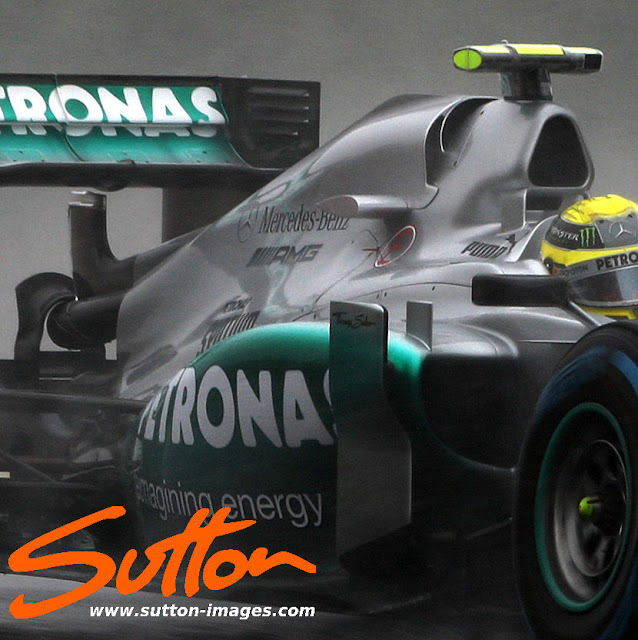 This is 'Air Spillage' and creates a turbulent airflow pattern over the engine cover but more importantly then goes on toward the rear wing. 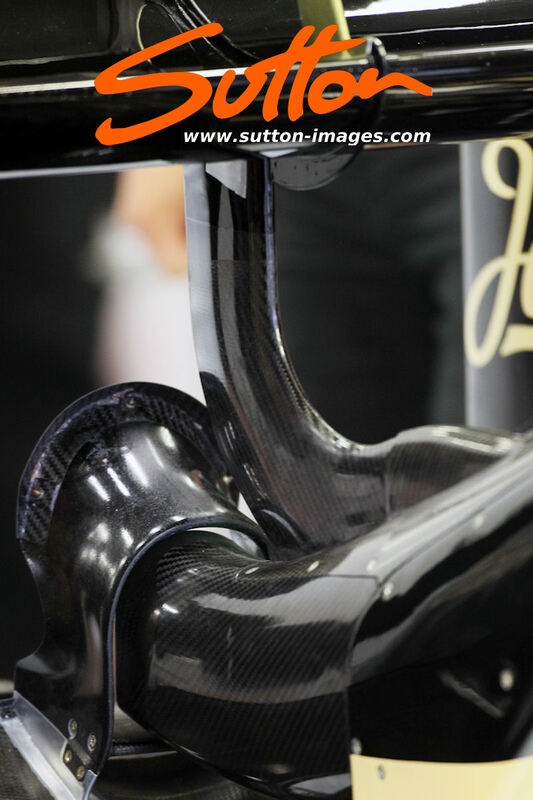 So when the Lotus is off throttle this airflow is collected by the 'Ears' and utilized further down the device but just as importantly it doesn't impede the more ideal laminar flow heading to the Rear Wing. 2. 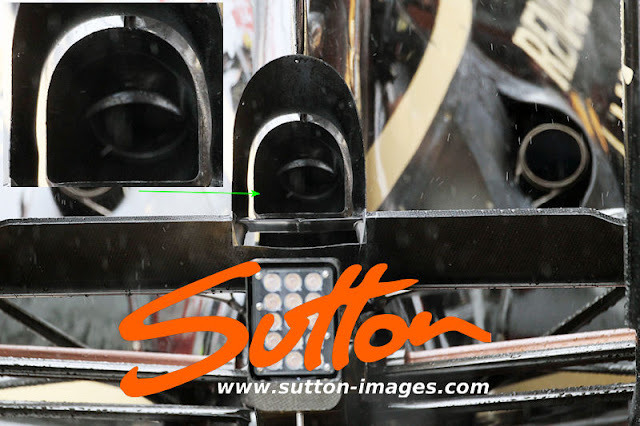 Internal Ducting during the build up phase on Thursday Sutton Images managed to get the following image of the Lotus E20 which shows that there are clearly 2 outlets from the airbox into the engine cover. 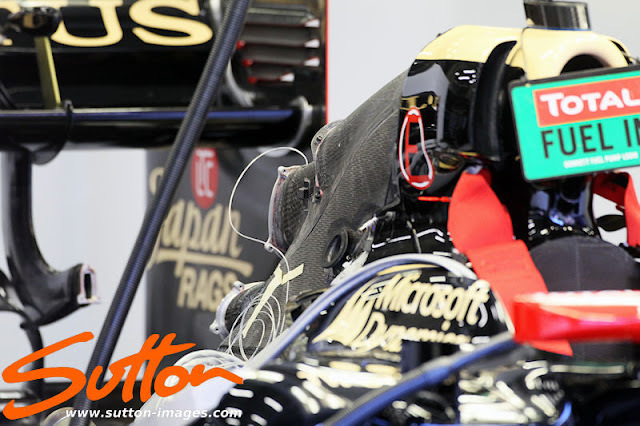 Previously we had assumed the air was being moved en mass from both the Airbox and Airbox Ears down the engine cover to the outlet at the rear. 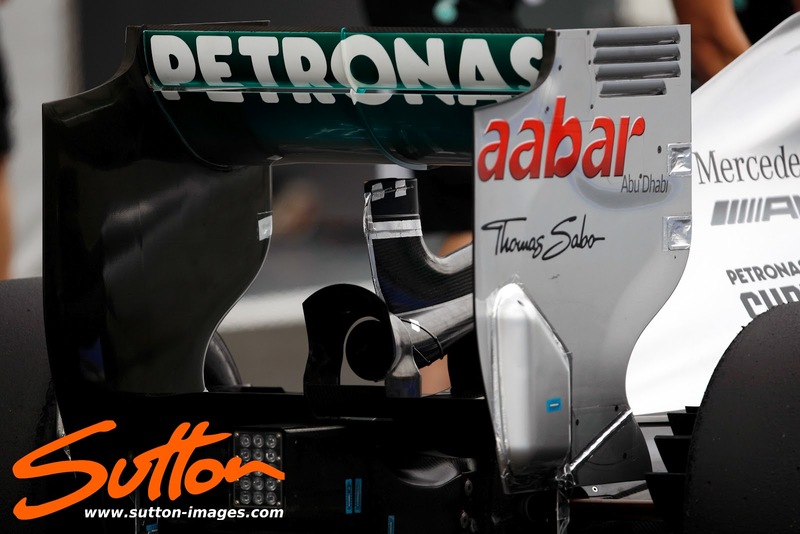 This now shows that the airbox and ears have seperate outlets with the top one most likely the pipe from the Airbox Ear's that feeds to the periscope. 5. Monkey Seat / Mini Diffuser is placed / being used in order to take advantage of the situation presented by the device in general. 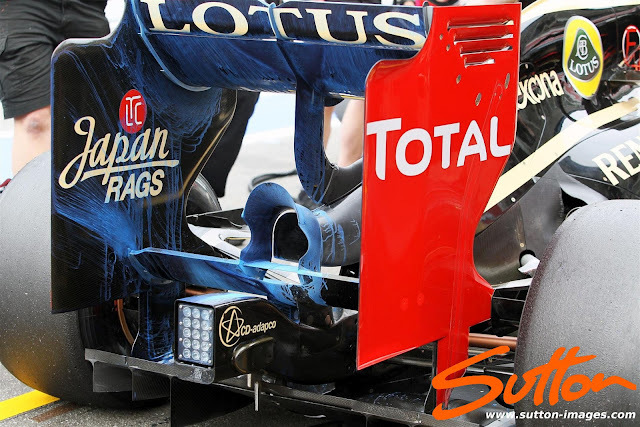 By adding this Diffuser shaped Monkey Seat the airflow will be pulled through the exhaust as Downforce is generated on top as seen by the stagnation of the Flow Viz paint at the trailing edges of the outer section of the Monkey Seat. 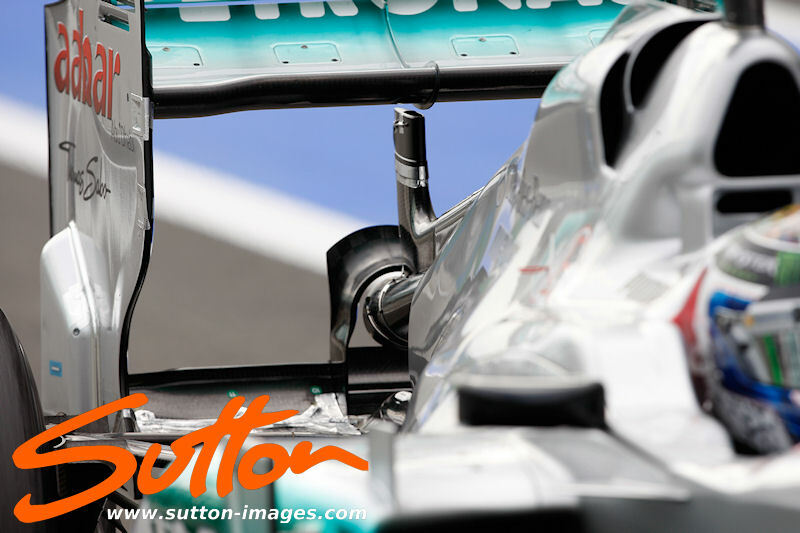 In the images above we can see that air consumed by the Airbox 'Ears' is transmitted along the top pipework and branches off to the Periscope. 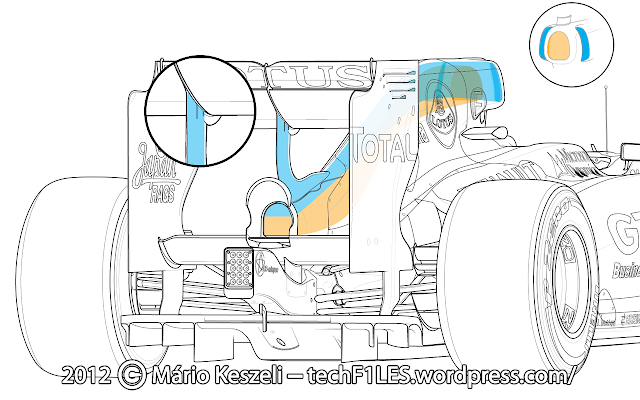 In the enlarged image of the Periscope we can see the ejector holes that blow air tangentially across the width of the Rear Wing main plane (The image below shows the effect of this when the team used flow viz at the Hockenheim weekend), blowing the underside of the wing reduces boundary layer build up which allows for a steeper Wing AoA to be run giving a net downforce gain. 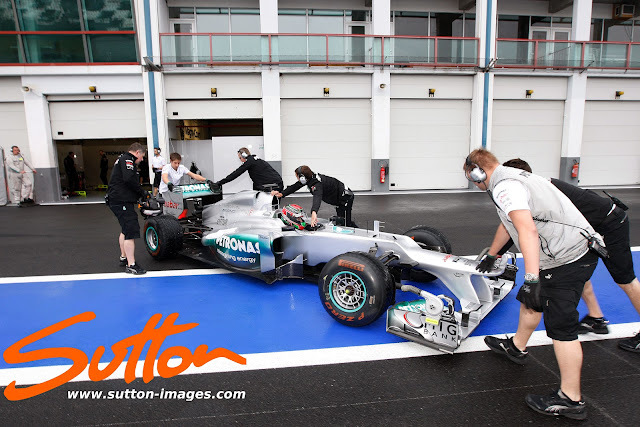 The amount of rear downforce available to teams has been reduced since the regulations stopped blown diffusers. Making the amount of downforce generated at the rear wing once again imperative. At a certain velocity the amount of air being blown isn't enough to prevent the boundary layer build up and the wing stalls. 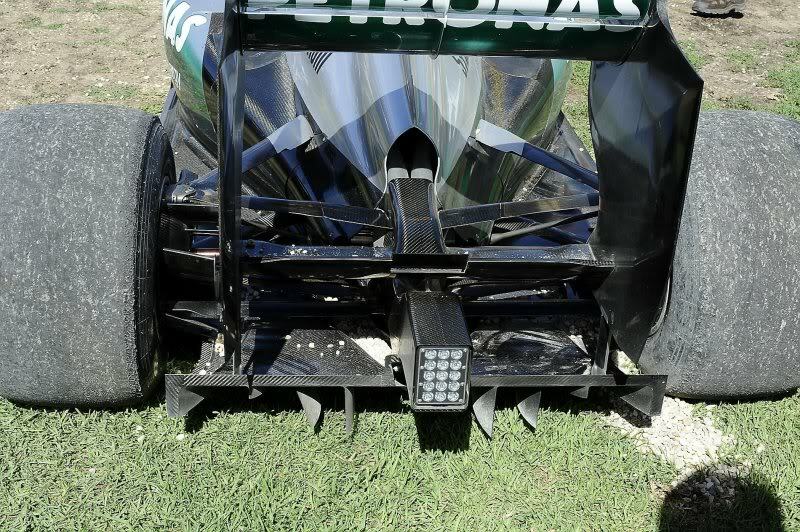 (CL Max) This reduces the amount of downforce and drag on the rear wing. 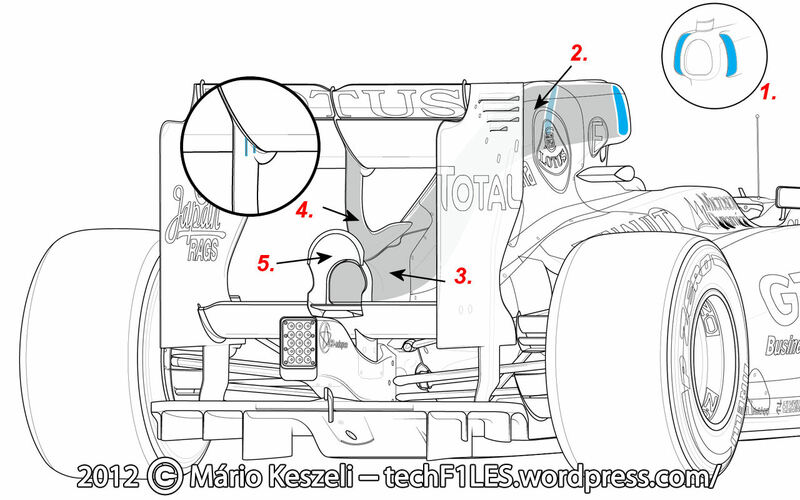 Simultaneously the air in the periscope now creates a blockage which allows the airflow to feed out toward the Monkey Seat / Mini Diffuser which will increase it's effectiveness creating downforce in this region. 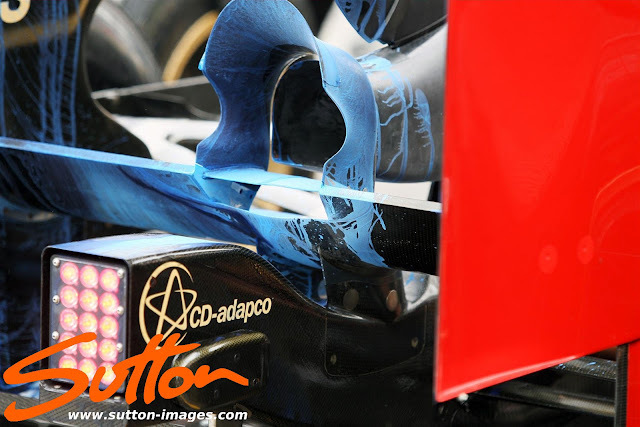 The switch from downforce creation to drag reduction is aided by the use of the Monkey Seat / Mini Diffuser as it helps transition the forces involved. The arrangement at the rear of the car is very similar to that shown on the Lotus however one thing is yet unknown due to the weather not allowing the 'Device' to be tested. We can see in the picture above and below that the Periscope doesn't extend to the underside of the Rear Wing Mainplane. It may be the case that Mercedes simply ran their usual Rear Wing configuration and didn't bolt on the Deeper/Higher AoA Wing they could use in conjunction with the DRD. The other plausible reason is that it is infact designed this way and Mercedes plan to attempt blowing a larger section of the Rear Wing to gain downforce / reduce drag. I see absolutely no reason as to why Mercedes can't continue to use DDRS in conjunction with DRD as one will not impact the other even in terms of packaging. As we can see below the twin pipes leaving the beam wing going through the chassis don't intefere with the placement of the Exhaust / Monkey Seat arrangement. 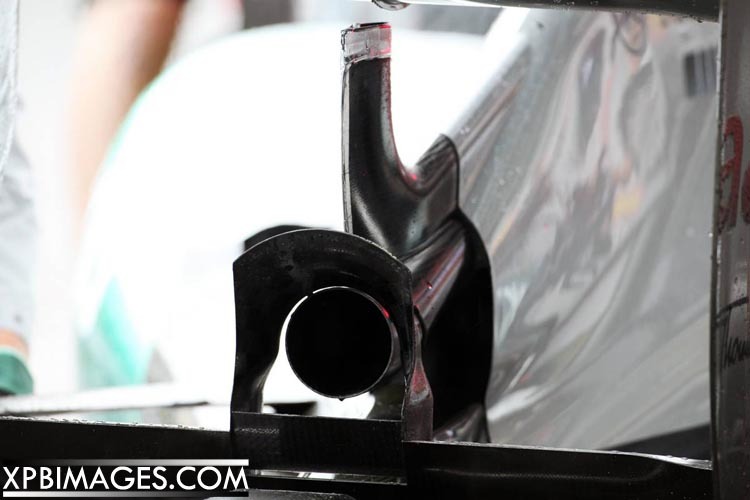 Somewhere down the line I would like to see a variation of the DRD that uses the monkey seat diffuser together with ducts blowing the floor as the periscope will be redundant next season. Won't be DRD then will it !